What did the 13th Earl of Derby, his twenty-two-year-old niece, Manchester’s Belle Vue Zoo, and even some ordinary laborers all have in common? All were avid collectors and exhibitors of exotic, and frequently unruly, specimens. In her study of Britain’s craze for natural history collecting, Ann C. Colley makes extensive use of archival materials to examine the challenges, preoccupations, and disordered circumstances that attended the amassing of specimens from faraway places only vaguely known to the British public. As scientific institutions sent collectors to bring back exotic animals and birds for study and classification by anatomists and zoologist, it soon became apparent that collecting skins rather than live animals or birds was a relatively more manageable endeavor. Colley looks at the collecting, exhibiting, and portraying of animal skins to show their importance as trophies of empire and representations of identity. While a zoo might display skins to promote and glorify Britain’s colonial achievements, Colley suggests that the reality of collecting was characterized more by chaos than imperial order. For example, Edward Lear’s commissioned illustrations of the Earl of Derby’s extensive collection challenge the colonial’s or collector’s commanding gaze, while the Victorian public demonstrated a yearning to connect with their own wildness by touching the skins of animals. Colley concludes with a discussion of the metaphorical uses of wild skins by Gerard Manley Hopkins and other writers, exploring the idea of skin as a locus of memory and touch where one’s past can be traced in the same way that nineteenth-century mapmakers charted a landscape. 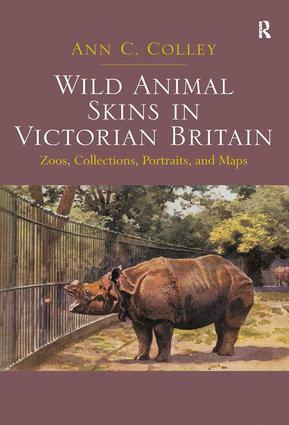 Throughout the book Colley calls upon recent theories about the nature and function of skin and touch to structure her discussion of the Victorian fascination with wild animal skins. Ann C. Colley is a SUNY Distinguished Professor at the State University College of New York at Buffalo. She has published numerous articles and books, including Victorians in the Mountains, Robert Louis Stevenson and the Colonial Imagination, Nostalgia and Recollection in Victorian Culture, The Search for Synthesis in Literature and Art: The Paradox of Space, Edward Lear and the Critics, and Tennyson and Madness.